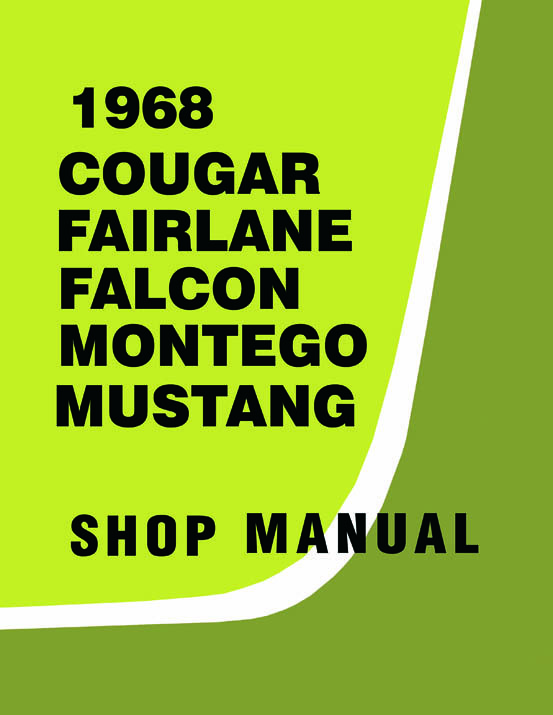 The 1968 Cougar Fairlane Falcon Montego Mustang Shop Manual is the manual that Ford mechanics used to service vehicles. There are detailed service procedures for brakes, suspension, steering, wheels, tires, rear axle, drive line, clutch, manual/automatic transmission, engine, ignition system, fuel system, cooling system, exhaust system, charging system, starting system, lighting, horn, instruments, body, doors, windows, trim, seats, convertible top, maintenance schedules and operations, lubrication charts and specifications. With the step-by-step illustrated instructions, specifications, and wiring diagrams, you will have the information you need to get your project on the road and keep it there. This manual covers all 1968 Ford Mustang, Falcon, Falcon Futura, Fairlane, 500, Torino, Torino GT, & Ranchero, as well as well as Mercury Cougar, XR-7, Comet, Montego, MX, and Cyclone.